Entries tagged with “Smith Quartet”. I barely listened to any music for a good half of this year and I also, in the interest in not having huge amount of unlistened to plastic objects littering my abode, tried to only buy things I knew I’d listen to a lot. I have to say that I did quite well in that regard thanks to various music blogs and Alastair Wilson’s top drawer Admirable Restraint radio programme. Thanks Alastair! Thus any sort of “best of” music list, even in the micro-domains that hold my interest, is even more useless than normal. But I found there to be quite a bit of captivating music – nearly everything I bought – this year and there is certainly some value in writing a bit about it. There won’t be many (maybe any) shockers here for those that trade in these realms – the usual suspects are all here – but I’ll try to make up for that with a few words on each. Not really reviews – you should buy them already! – and not really critical commentary either; perhaps it’s just rambling. Whatever it is, this is what I’ve got for you this year. In September of 2011 Jon Abbey (Erstwhile Records) put on the most ambitious to date of his Amplify festivals: AMPLIFY 2011: Stones – two weeks at The Stone in New York City followed up by several days at the Issue Project Room in Brooklyn. On September 11th, 2011, the ten year anniversary of al-Qaeda attacks on US power structures (more here if you are somehow unaware of this), the nights activities included this solo performance. Keith Rowe certainly had a burden of expectations placed upon him by his audience. A burden that he could choose to ignore as a British expat living in France, but one that he rose to embrace as a citizen of a world that has been transformed by the American lashing out in the aftermath of these attacks. Unlike EL007, September utilizes just the Dvorak piece as it’s framing device, but he works much more with extended radio grabs. These being from NYC on September 11th, 2011 create a similar aural zeitgeist as you would have found in 2001 but shifted by ten years of a pop and media media landscape that had been irrevocably transformed not just by the passage of time but by the events of that day and the aftermath. The pop music, much of which is even older than the ten year shift, can perhaps evoke in the listener the phrase “the banality of evil”, but is that not too a projection on the part of the listener? In many ways the whole enterprise is — memory, nostalgia, loss and false memories. I noted in my review of the concert eventually released as EL007 that Keith was playing with, complementing, even reinforcing the classical pieces he used as his framing device. With September the Dvorak is likewise not directly abused or deconstructed; the piece isn’t about the Dvorak. Instead it is held up in contrast, wistfully, as an exemplar of a world that never was, that can not be except in our imaginations and channeled into our art. And perhaps even there that world is lost to us. False memories of a world that never was, a world for which we feel such an intense loss and are nearly immobilized by our nostalgia. My listening has been highly backloaded this year; I spent much of year on a cross country bicycle tour and when I returned to Washington State there was a lot to listen to. This set came out while I was on tour and was one of the first things I acquired upon my return. I never listen to headphones when I’m bicycling because apart from being patently unsafe it puts you at a remove from the environment and denies one a a true pleasure in my mind: listening to the sounds that you are immersed in. One who’s ears are open hears a lot and if there is one thing I’ve learned over my years of listening to experimental music is how to piece together disconnected sounds into an immersive experience. This ability has meant that my relationship with field recordings is somewhat complicated. I’ve worked with them myself for a decade now as detailed in this post on World Listening Day and I of course love many recordings that. I tend to feel that field recordings can make great material and in certain cases can stand on their own, but are often used lazily or as a type of cultural tourism. Toshiyua Tsunoda has long been a favorite musician, one of the few who is able to release “pure” field recordings that are absolutely captivating. This skill is akin to photography in that a skillful photog can make a piece of art out of the same scene that your average shooter can not merely with camera placement, framing and working with the available light. A field recordist can control mic placement, when to start and when to stop the recording and some bare settings on their recorder. Both a photographer and a field recordist can apply effects, edits, overlays and the like upon a finished piece but it is then no longer “pure”. I for one don’t have much of a problem of this impure results, but it is a different thing, use the recordings as “material” as opposed to as a thing in and of itself. Michael Pisaro in his compositions often uses field recordings as material and also as an ‘environment’ in which his compositions take place (akin to the notion behind my “out of doors” series). The combination of these two musicians was something I was highly anticipating and I have to say I was not let down. This set has been hard for me to write about, it has a presence and immediacy that just seems to exist. It is hard to talk in the same way that field recordings can be hard to talk about, but this is much more a piece of music. I haven’t seen much written about it, essays or statements from the artists and the reviews I’ve seen have seemed to share the difficulties that I have. Simply describing the sounds used, or guessing at them, talking about Pisaro’s contributions versus Tsunoda’s and all of that just seems of little merit. I was immediately captivated by this set and it immediately became my favorite thing I heard this year. As I began to catch up on other releases and acquired some new ones, nothing ever did displace this though the previous and the following releases joined it as my favorite music from this year. So really all I feel I can say about this, is that you need to hear it. It is absolutely engaging and interesting and challenging and musical. Perhaps my favorite thing from two artists of whom I like many, many things. I’ll have to think about that some – I do like so much from these two. But this is certainly the collaboratively project I’ve like the best from these two. The first volume of the this three volume set from Matchless Recordings was a favorite release from last year and I fully expect volume three to make next years list. But volume two is certainly going to be my favorite of the three. I wrote at length in this post, For Morton Feldman, about my love of Piano, Violin, Viola and Cello and this particular recording of it. Simply having a recording of this piece, given at the pace it requires, from John Tilbury, my favorite interpreter of Feldman is enough to put this right at the top of this years favorites. I won’t write more of this particular piece – see the linked post if you want my thoughts and history with the piece. Patterns in a Chromatic Field is the other piece on this DVD which is also given the best performance of this piece I’ve heard. Now my relationship with this piece is complicated. I’ve listened to it many times in two other versions. The first of these was performed by Charles Curtis (cello) and Aleck Karis (piano) released on Tzadik. Curtis is an excellent cello player and I think his work here is top drawer. This piece launches right into it with a frantic, sickly cello line as the piano plays big bass clusters. Shorter realizations of this piece find this initial cello part too frantic the piano part rushed. Now it is not supposed to be languid but even just a few extra minutes can let this breath and let that opening not dominate the piece. I soon moved on the version of the piece released much earlier on hat[now]ART as performed by Rohan de Saram (cello) and Marianne Schroeder (piano) which at around 1’45” is the longest version I’ve heard of this piece. No one can accuse this performance of rushing the piece. I dearly love Rohan de Saram’s playing and if I had a dream version of this piece it was with him sawing the cello and John Tilbury tinkling the ivories. While this is a very cello forward piece the piano, as always is the case with Feldman, is vital and the performance demands that ineffable touch. As has been said by myself along with many others, Tilbury has that touch. While I think many are good at performing Feldman, and I’d place the pianists of both of these other performances in that category, few are are great at it. Tilbury is and his magnificent touch is on display here. Even those opening clusters you can hear him pressing down on the keys with a velocity that hovers at some point. There is somehow still a softness to it amidst the big sounds. Feldman’s string pieces with piano always have an interesting relationship to the piano. From Piano and String Quartet which the piano only place arpeggios to Piano, Violin, Viola and Cello where the strings are like the effects on a prepared piano there is never the attempts at a merged soundworld. The Smith Quartet do an excellent job at all of the string parts and while one may think of Irwin Arditti or Rohan de Saram as string players you’d love to hear in conjunction with John Tilbury I can find no fault in the musicianship here. These three DVD-A sets, which allows these pieces to unfold uninterrupted at around an hour and half each are sure to be considered among the very best realizations of these pieces and absolutely essential for an understanding and appreciation of these great compositions. I’ve long been a huge fan of Ullmann’s A Catalogue of Sounds (also on Edition RZ) and furthermore enjoyed a string quartet of his recorded by the Arditti’s. But another piece of his, voice, books and FIRE 3 (again on Edition RZ) I consider one of my biggest disappointments of all time. It was because of how much I loved A Catalogue of Sounds – a piece I’d place somewhere on my favorite pieces of all time list – and how much I didn’t care for it. So I really hesitated on picking up this set. This is set of three CDs and Edition RZ stuff is always expensive, so what with the disappointment of the last piece of his they put out it was hard to take the risk. But good notices came in from people whose opinions I respect, people who also love A Catalogue of Sounds, and ErstDist was selling it for a quite reasonable sum so I decided to take the chance. Of course it turned out to be fantastic, probably another set tied for the top of the list. But I just haven’t had enough time to come to terms with all of the music herein to honestly make that clam. The music is much closer in to A Catalogue of Sounds, especially on discs 2 and 3 – low dynamics, tentative brittle scrapes and percussive bits even some beautiful voice tones on disc three – the first use of voice I’ve liked from Ullmann. Disc one is pretty different with two shorter pieces instead of the disc length pieces of the other two discs. It is (of course) still pretty low dynamics, but much more varied, with a few louder interjections. The three discs are chronological with disc 1 featuring pieces from 1989 to 1993, disc 2’s single piece written between 1997-99 and disc 3’s piece the most recent composed between 2004-2007. I should say that this is a very handsome set. The black on white on black of the box with it’s (seemingly) cryptic lines and dashes is really a stunner. Inside it continues to impress with the best individual disc sleeves I’ve seen. Each disc is housed in a little booklet with a pocket for the disc, the ever inscribed with disc number the same fragmented letterset of the box cover (and the Edition RZ composer series in general) and the interior featuring an image from the score. The back contains the textural information – title, year, performers et al – each disc like an individual Edition RZ release. Really well done and by far the nicest traditional release I purchased these year. The set comes with very nice liner notes by Bernd Leukert which discuses much of the notions and material of each of these pieces as well as notions on Ullmanns goals and ideas. With the little amount of time I’ve had with the set I’m going to beg off on any further writing on it. Read these liner notes for better information than that I can provide at this moment. I’ll end by simply saying that I love the music on this set; I have listened to it a lot since getting it and it will need a lot more listens. Maybe I’ll try to write more about it at a latter date, but just thinking about trying to write something for A Catalogue of Sounds, which I’ve been listening to for half a decade I suspect I’ll never really know what to say. Perhaps that says enough. In the spring of 2010 I had the good fortune to be able spend four days in Boston attending the Christian Wolff at NEC events. 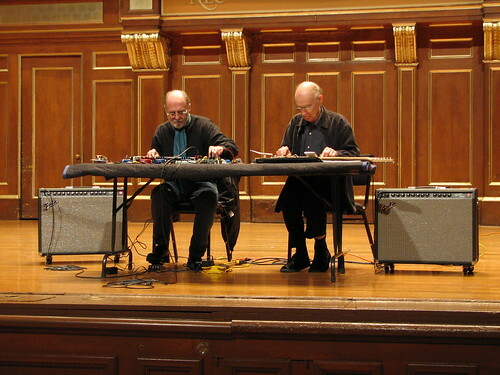 Keith Rowe was there to perform several pieces and among these was a duo improvisation with Christian Wolff. This was a pretty short (though wonderful, read about it here) performance, 10-15 minutes and thus at the AMPLIFY 2001 their duo was able to be billed as their “first full length” performance. This CD of course is the document of that performance; perhaps the performance I was most unhappy to have missed in 2012. At the 2010 meeting I had truly wished for the performance to go on at length but it seemed that Wolff tends to prefer a shorter statement. In the performance of Edges, along with Rowe and NEC students, which is a graphic piece where you move through the material at your own discretion he was among the first, if not the first, to do so. So it is interesting to hear him improvising, in a situation with very little cover, for around 40 minutes. Christian of course played with AMM during their most innovative and unruly period, concerts that could go on for two or more hours, so I really never doubted that he would rise to the challenge. He operates here similarly to his performance of Edges (which was indeed written with AMM in mind) moving through various gestures and simply allowing more space, more deliberation in them. Keith is operating in his recent, more more pared down mode – which I feel is the the only time in his long career that he has bent toward the prevailing aesthetic as opposed to pioneering it. Of course one could argue that he’d pioneered it with AMM back in the 60s and it is simply a return to the form for him. And yet it is the prevailing aesthetic in the circles in which he is best known and he had not moved to embrace it until pressed to. However once Keith moved in this direction I think he really showed how it should be done. That is he lets the silences be silences whereas I think most ‘silencers’ push the silence around (to paraphrase old Morty). The spaciousness and deliberation of both of the performers here works quite well, as does Christian seemingly moving through his gestures Edges style. Keith very slowly, at a pretty low volume, works with a few textures with again much space between them. The more upfront gestures seem to mostly come from Christian, again evoking Edges (one of the symbols is to make a loud noise). In fact considering Keith’s excellent and very subdued version of Edges on the excellent Christian Wolff double CD on Edition RZ from last year, this really could just be an unannounced duo performance of the piece. Thus you end up with a piece similar to the late Cage Number Pieces in which the events elide due to individual variations of choosing spaces. A wonderfully taught piece, with sounds from the Stone and the City nearly on equal footing with the performers own. Without a doubt the most engaging bit of duo improv (a diminishing genre in these circles) I heard this year. This year was the John Cage Centenary and there was many great Cage releases and re-issues put out this year. Too many for me to keep track of or acquire all of (I really regret not hearing the four CD set of Etudes Australes performed by Sabine Liebner for instance) but good to see both in recordings and concerts Cage’s legacy seriously tackled. Among the most interesting of all the releases is this historical document of John Cage and David Tudor in Japan. The impact of their tour was described as John Cage Shock which was used as the title for this three CD set. In this tour Cage championed new music beyond his own with pieces from Christian Wolff and Karlheinz Stockhausen being performed along with pieces from Japanese composers Toru Takemitsu and Toshi Ichiyangai. What is most interesting to me about this set is that it documents further use of David Tudor’s Amplified Piano that was so stunning on his realization of Variations II. Volume 1 of this set includes another version of that piece, shorter and not quite as powerful but more crunchy and even more noisy at times – A nice addition to the version available on Edition RZ.. This colume also includes a great version of Takemitsu’s Corona for Pianists and a Wolff’s Duo for Pianist & Violinst. All three of this pieces are excellent and this is I think easily the most essential disc in the set. The amplified piano can also be heard on volume 2 in the realization of Cage’s 26’55.988″ for 2 Pianists & a String Player. Alas this performance is marred in my opinion by the interjections of Yoko Ono (whom I can like just fine in other contexts). As the other piece on volume 2 is Stockhausen’s Klavierstück X which is a piece I for one don’t care much for, I find volume 2 to only be of historical interest. The goods return with volume 3 which opens with a great, noisy realization from Cage of his 0’00”. Music for Piano #7 from Ichiyangi, a graphic score that Tudor interpreted with sudden and spaced out interjections on the piano while various electronic and concrete sounds are projected. Interesting to hear with some great sounds but not a piece I’m going to play a lot. The disc also includes the rather indifferent and unmemorable Composition II for 2 Pianos composed by Micheal von Biel. Musically the whole set is pretty mixed. I would have been satisfied with Variations II, 0’00”, the Takemitsu and the Wolff which could have fit on a single disc. But the set is quite nice with folde out liner notes in English and Japanese each with a nice sized picture or two on them. The set I bought also came with three postcard size photographs of Cage and Tudor from the tour. The document of the performances that created Cage Shock in Japan is certainly of a lot of interest for Cage enthusiasts along with those interested in 20th Century composition and the development of Live Electronics. While I may not connect with every piece I certainly value this entire set. While this may have been John Cage’s centenary year, his fellow NY School composer Morton Feldman received a number of fantastic releases this year as well. Few were better than this historical document of the Feldman Soloists – a group of musicians who performed Feldman’s work during his lifetime – performing Crippled Symmetry in Buffalo NY in June of 1983. This turned out to be one of the best performances that we had ever given together. The rare and indescribable “magic moment” of occasion and ambience seems to have inspired us.” -Eberhard Blum writing on this performance. I often turn to Morton Feldman to listen to as I fall asleep. I’ve long been burdened by insomnia and putting on music as I go to bed often leads to me listening to the entire thing before eventually falling into slumber. Some nights though I fall asleep relatively quickly and thus I like music that is both soft and gentle but that is worth one’s attention. Feldman has long been in that category for me and thus he is often on my night stereo. This set has gotten a huge amount of play in that regard and thus I’ve listened to this as much as anything this year. Of course it has also been played numerous times without the hope for sleep being involved and it is just an absolute stunner. I have two other versions of this piece including one by this very same ensemble released on Hat. I’ve played these other versions many times over the years, but the energy and vitality of this live performance is just unmatched. Compilations are almost always mixed affairs and this is no exception. A USB memory stick with ten uncompressed recordings from people and groups who performed at or otherwise involved with the Dotolim venue in Seoul South Korea. The memory stick itself is quite cute: a little plastic square with plain text of the title and different colored rubber covers on the USB jack. Definitely my favorite bit of packaging from this year. Once you plug it into your computer you can run in your web browser and html page that serves as index and allows you to play the individual audio and the one video file. Of course one can just as easily copy the files over to your computer and play them with the device of your choice which was the method I chose. The set features five solos from Joe Foster, Kevin Parks, Jason Kahn, Tetuzi Akiyama and Ryu Hankil’s solos. I really dug those from Foster, Parks, Kahn and Hankil but found the Akiyama rather short and slight. There are noisier pieces from Astronoise and Transistorhead that didn’t do much for me at all, but of course your mileage may vary there. But to me the highlight of the set was the quartet of Hong Chulki, Choi Joonyong, Joe Foster & Jin Santa and the duo of Olaf Hochherz & Jamie Drouin of whom I was previously only minimally familiar The quartet with its fluttery metallic sounds, rotated metal, crumpled amplifications and spaciousness feels like a lot of familiar ideas pushed one step beyond flirting with a structureless structure and is just completely riveting. The Drouin and Hochherz almost sounds like a duo of Sachiko M & Sachiko M with the pure tone and the fluttery side of her work playing together along with a sprinkling of the contact mic she sometimes deploys. Yet the context and the structure of this piece is all it’s own and there are sounds that Sachiko doesn’t try for. Thus it is a rare exploration into that soundworld and one I found completely captivating. In a period where composition seems to be leading the way, at least capturing the bulk of the attention, improvisation is alive and strong in Korea. There is a lot of risk in the work coming from there and it often doesn’t entirely succeed. But the risk is necessary and the payoff is high. If one’s attention isn’t solely on composed work at this juncture you can do no better than to tune your ears to the small but thriving scene in Korea. Fields have ears has a long history of it’s development, iteration and performance which Pisaro details in this fascinating post on the Gravity Wave blog: Some Some thoughts on the “fields have ears” series. The series of pieces named fields have ears represent my attempts to come to compositional terms with different notions of “fields”: how we hear them, how they might hear themselves, and what there is to hear. – Michael Pisaro, from the aforementioned blog post. I happened to be at the August 2011 performance of the the piece for guitar and sine waves in Seattle, (and met Michael in person for the first time as well) which I quite enjoyed and is interesting to contemplate in relation to this later version of the piece, in which the Seattle performance is incorporated. After that performance I picked up the realizations of the related pieces released on Another Timbre, which records several different iterations of the piece from several different ensembles. This I have to say is also a quite enjoyable disc and that I really liked the different realizations herein. These pieces have a lot more in common with the live performance I witnessed in their spare structure and delicacy which makes this disc an ideal companion for this new recording and along with the textual material allows the listener to really engage with this piece and it’s history. One thing I’ve found is that is a lot of the Wandelweiser and related musics work far better in live performance than recorded. That is the music seems to be activated by their surroundings and since they often use space and silence these surroundings are oft given quite a prominence of place. I think that Pisaro has been the most successful of these related groups of musicians at translating his pieces to the recorded medium primarily because, I suspect, he takes the medium in account. That is the pieces released are often more layered, incorporate field recordings or specially take the limitations and differences of playing back a piece into account. Whereas a live recording of a performance such as the one I experienced in Seattle might seem slight or overly thin this really is a limitation of open air recording versus the listening experience. The way that we shift our focus from all the sounds that surround us and the effects of the space from two ears separated by the skull is quite different from what can be recorded. The listener constructs the piece as much as the muscian and the environment. It is this that I think is the difference between the versions of fields have ears: in the realization of (6) for the Gravity Wave disc Pisaro layered together different performances and recordings of various versions of the piece and added some site specific field recordings. This takes advantage of that effect, that John Cage understood so well with all of his simultaneous performances, happenings and “musicircuses”, of the layered event. The brain automatically fits sounds (and images too – watch any video the sound off and the music of your choice playing and note out it “syncs” up) together and creates it’s own context. For is this not how we experience sound all the time in nature? So what began as something like a well-regulated garden became a space filled with all kinds of material, now resembling a rather unruly city park.” -Michael Pisaro, from the fields have ears (6) liner notes. The John Cage piece that even those who don’t like John Cage enjoy. This relatively early (1946-48) piece, one of the last before Cage had fully embraced chance operations, is one of the pinnacle of Cage’s prepared piano works. This piece listened to in it’s entirety, develops as it goes along with a gentle tension and release and a wonderful percussive aspect that more fully explores the prepared piano than any other of Cage’s pieces to utilize the instrument. This is the most recorded of Cage’s pieces and is widely available from the original performance by Maro Ajemian to my personal favorite by John Tilbury. With so many versions out there one may wonder why it is this one is essential to add to one’s collection. The answer is that James Tenney, a fellow composer in the experimentalist tradition, adds much to one’s appreciation and understanding of this piece with his realization. Tenney heard Cage himself performing this piece at the age of 16 and that turned his head enough that he pursued music along with science and engineering. These dual interests informed Tenney’s experimentalism – his scores often worked with acoustical properties and explored mathematical functions. Furthermore he performed the Sonatas & Interludes throughout his life and this familiarity, expertise and love of the piece combined with his engineers precision in the preparations lead to a faithful yet unique realization. The preparations, which Cage detailed in his typically precise yet idiosyncratic way (for instance he uses measurements for the placement of the preparations that are based on a specific piano instead of being scale independent), were hand selected by Tenney based on he thought it should sound. So while he followed Cage’s instructions his primary driver was the sound. His performance was informed by his compositional interests in sound and relationships of sound and thus he performed the pieces a bit more brusquely than is typical. Listening to this with an ear toward the interactions of the sounds as opposed to the melodic and rhythmic is truly rewarding. While I may turn to the Tilbury two out of three times this version will be that other play. Beyond the historical interest of the Maro Aiemian recording these two recordings of the piece will suffice. These six records are all as different as can be and are all ones I enjoyed quite a bit. The Kinoshita/Murayama (which I especially love the cover) I perhaps received too recently to really fully absorb. While I think that Kinoshita’s work is marvelous here I found that Murayama, while in the main adding very interesting and compatible sounds sometimes lets loose with sounds from his drums that pull me out. Too on the nose as it were. Overall solid and worth hearing, but just shy of greatness I feel. Beuger has often left me cold and while I have enjoyed several of his compositions, it is this one that I feel I have truly connected with. There is a lot more diversity to the sound and dynamics here and a playfulness – perhaps brought by the performers – that I’ve found lacking in his work. This disc is definitely recommended for those that may have shared my skepticism, but also for those who feel like I do that Wandelweiser stuff is best live and in recordings that capture that aspect. Neumann and Jones put out the only other outstanding duo improv I heard this year. Admittedly I didn’t seek out everything and thus you can take that for what it’s worth, but I heard enough clips and read enough reviews that I only bought things that I felt would appeal. And this one surely did. I’ve enjoyed both of these musicians work for years and I was really excited to hear this recording. I was a little disconcerted by reports of singing and text recitation which is often overly affected and earnest in experimental contexts but this small bit of that here works effectively. Lafkas’ large ensemble piece is a sprawling work that drones and chatters but always seems well considered. Another disc I got too late to absorb fully but one I’ll definitely return to many times. At the end of my cross country bicycle tour my thoughts increasingly turned to the music of Codiene, the “slow core” band from the early 90s that were a mainstay of my later college years. On arriving in Bar Harbor I found out that they put out a set including their three albums along with three CDs of unreleased material (and also toured briefly). Quelle Coincidence! Owning the originally albums I didn’t feel much need to buy the whole set (plus I no longer have a turntable) but I was delighted to find I could purchase the unreleased material from iTunes. And so I did. These tracks, plus the original albums once I was back home, got many, many plays. It’s been a great year for the New York School with absolutely vital discs featuring John Cage, Morton Feldman and Christian Wolff released. Happily Earle Brown wasn’t neglected either with Wergo putting out this top notch set performed by my second favorite pianist Sabine Liebner. This set has piano versions of all of the expected “hits” plus many more, much more obscure pieces. All of these absolutely beautifully and creatively rendered by Lieber. Brown’s graphic and open works demand this creativity and likewise require many versions to get any sort of handle upon. Thus this is a most welcome addition to my collection of Brown realizations. I’ve mentioned many times here and elsewhere that John Tilbury is my favorite interpreter of Morton Feldman’s piano music and the piano music is my favorite of Feldman’s work. The solo piano pieces, especially his last few pieces, are masterpieces but I’d also accord such plaudits to a number of Feldman’s chamber pieces. The Music for Piano and Strings series on Matchless features a number of such pieces and the first volume begins the series incredibly strong with two of his best as well as personal favorite pieces. Feldman often used the piano in his chamber pieces, sometimes in a similar way as to the solo piano pieces, but at other times in rather different ways, using a wider variety of techniques and trading off foreground and background roles with the other instruments. To understand what I mean by this one has to consider how strings are used in these pieces. But Feldman doesn’t go through all of the available tricks from musical history, no he goes through all of his tricks. And at times, even in a long piece he’ll severely restrict himself: in Piano and String Quartet the piano only plays arpeggios, for an hour and a half in this recording. Feldman varies the arpeggios throughout the piece, their pacing, the weight of the individual notes the space between the figures, but he’s only using one technique. Of course there is also the strings which sustain this, though they also don’t explore the entire range of his techniques for strings as he does in his String Quartet peices, no it is the interplay of these five instruments in this piece that allows for just restricted material. This for me is what really distinguishes Feldman’s chamber pieces: it is the sound of the instruments playing together, the way that he approaches that seems completely unique. The above quote from Mode puts so well something I’ve been struggling to describe here and as I said is really to me the essence of Feldman’s chamber work. In the pieces on this disc. The way that a note on the piano dies away and then the dry bowed violin resonates with that decaying sound. The almost organ like tones of a chord built up from all four players of the string quartet playing with that gasping sound of vibrato-less bowing, combined with soft tinkling piano notes slowly revealing themselves as the chord fades away. The Smith Quartet, whom I was not at all familiar with prior to this recording, handle these pieces incredibly well. There is the right softness, dryness of tone and commitment to Feldman’s intentions. The use of the baroque bows to elegantly solve one of Feldman’s conditions to me shows innovation and flexibility and the sonic results prove that this isn’t just for their own benefit, but is the best solution to the problem. I look forward to spending more time with this quartet, first in the rest of the Music for Piano and Strings and then exploring more of their work. From ancient China there is a description of a vibrato technique: Remarkable is the ting-yin, where the vacillating movement of the finger should be so subtle as to be hardly noticeable. Some handbooks say that one should not move the finger at all, but let the timbre be influenced by the pulsation of the blood in the fingertips pressing the string down on the board a little more heavily than usual. What more is there to say John Tilbury’s performance of Feldman? Tilbury gives his highest accolades to Cornelius Cardew and David Tudor for their performances of Feldman(1) and I certainly can’t disagree with his assessments of their performances of Feldman’s early pieces. But it is not just for the lack of them having played Feldman’s later pieces that Tilbury is the one I want to hear on these pieces. His touch, his light foot on the sustain pedal (a technique he got from Cardew(3)) his extreme sensitivity to the sound and most of all his deep commitment to these pieces are I think unrivaled. For a long time I’ve wanted to hear the chamber pieces with Tilbury tinkling the ivories and I can’t say how excited and grateful I am that Matchless is putting this set of recordings out. I recall being in Vancouver participating in a workshop with John Tilbury on Cardew’s Treatise (read about this here) and while we were sharing an elevator he was telling an anecdote about playing various Feldman chamber pieces in California. I completely forget what the point of his anecdote was but it involved the playing of For Philip Guston and my one thought at the time was “Why wasn’t this recorded, I want to hear For Philip Guston with John on the piano!”. While the Music for Piano and Strings sets won’t include all of Feldman’s chamber pieces with piano, it certainly contains a large subset of them and among these my absolute favorites. One senses a connection to jazz in Feldman’s subtly emotive chords. And beyond that, in the music’s “touch” and “swing”. The touch is in the minimising of attack (Baroque bows are used on this recording). The swing is in the rhythmic dislocation, a feature from the beginning but pursued most exhaustively in the long works of the last years, For John Cage being a prime example. This is the third recording of For John Cage that I’ve heard and while I’ve only listen it a few times so far it has quickly become my favorite. For John Cage is scored for piano and violin and thus the piano is of utmost importance. This also is the longest version I’ve heard by far and while this never a priori means it is better in this case I think it is important. I’ve always felt that there was a sense of urgency to the piece (especially in the almost frantic seeming violin in the opening notes) from the other recordings that I have and I always assumed that was an aspect of this composition that was a bit different from much other later Feldman. But with almost twenty-five more minutes to the piece then my previous favorite version of the piece that sense of urgency becomes a lot less frantic. In fact it becomes more typical of the tensions that you find at various times in Feldman’s pieces (amongst all of his tricks as I quoted earlier). There is a variance to the dynamics in Darragh Morgan’s violin that is more superb then anyone else I’ve heard on this material. He’s always at Feldman’s famous ppp but within that dynamic seems to subtly shift the volume all of the time even within a bow stroke. It could be that this is what creates that shimmering quality to the strings that I noted earlier. Tilbury’s piano is at its most bell like here, perhaps just the smallest amount of extra pressure on the sustain adding just a bit more of a ringing character to it. The interplay between the piano and violin is fantastic in this piece, there is a section near the beginning where the piano plays two notes and the violin responds with its own pair of notes in a call and response that comes across more as two timbres of a bird call. In a later section after focusing almost completing in the far upper register of the piano and violin a single low piano key is struck and repeated and those low tone reminds us of the entire range of sound and dynamic and as played here it is so warm and fat that it is like finding a perfect garden in an arid wasteland. These moments are Feldman’s brilliance in composition and the way the sound is thanks to the incredible touch of Tilbury and Morgan not to mention the excellent recording from Sebastian Lexer. Which of course is about this very performance! He mentioned this again to me in a recent email which sent me looking for this quote to share here. In my reply to his email I said I’d have been tempted to leave those sounds in it being For John Cage after all (which you see Richard echo a bit here) and in his reply he mentioned that Sebastian Lexer had digitally erased all evidence of this from the recording. This is certainly the case and the recording sounds amazing. I can’t say I’ve noticed the slight speed up that Richard mentions, but I did notice at one point that the space suddenly seemed flat, that is to say the natural sound of the instruments reverberating in this space seemed different then it had before. I honestly wasn’t even listening for this when I first noticed it, in fact I was reading a book and my attention suddenly shifted back to the music as it had clearly changed. Not an incredible difference and depending on people sound environment and stereo may not be too noticeable at all but I’m sure this aspect was a bit altered by scrubbing those other ambient sounds. But it is a tremendous job and I’m quite thankful that the effort was made giving us this pristine and incredible version of this piece. Piano and String Quartet is like breathing; and like dying. The matter is of life and death. There seems to almost always be a shimmering sound of this resonance interacting with the beautiful bowing. In a recent post about the Kronos Quartet I mentioned how their sound had a bit more dynamic nature to it then the version of the piece from the Ives Ensemble and I have to say the Smith Quartet also has that ethereal quality to the strings. It clearly isn’t a vibrato technique (unless it is that which is transmitted by the blood itself that Tilbury describes in the quote above) but is clearly some quality of their performance. Perhaps it comes from playing super softly at a level below with the Ives Ensemble does (which is still plenty soft) or perhaps it is subtly shift the volume in the course of a bow stroke, the slight change in pressure reverberating slightly. The strings so often play as one in this piece, the bows slowly arc out in a soft chord, then pausing briefly and then returning over the strings somehow even softer. As the sustain pedal is always pressed on the piano these gentle movements, like breathing really, always begins over this residue of the previously played arpeggio and this interaction is beautiful and endlessly fascinating. As I reported in the aforementioned Kronos post this was the first Feldman piece I ever heard and I can’t deny that its one of my favorites. Pretty much for the reasons I’ve given above: the piano and the way its used contrasting with the way Feldman uses strings, is just so compelling to me. It’ll take a lot of listens before this approaches the amount I’ve given to the Kronos and Ives versions but the piano is so glorious and the strings are as good as any I’ve heard. This easily catapults right to the top of my favorite recordings of this piece, though the Kronos/Takahashi version is right up there (Feldman more or less wrote the piece with them in mind, it certainly can be thought of as the reference version). This recording I think will reveal how wonderful this piece is to those who may not have previously been as taken with it as it aptly demonstrates this as one of Feldman’s major compositions. This DVD is a real bounty, it would be akin to two double CD sets of music. While initially I was somewhat resistant to getting music on DVD I have to say I really love hearing the pieces uninterrupted. On this disc the pieces were recorded at DAT quality (48kz/24bit) and while they sound really good, they do not quite approach the amazing sound of the recently reviewed Mode Trio disc which was recorded at DVD-Audio quality (96khz/24bit) as well as in surround. No complaints really from me, these sound superb and I for one am not setup for surround sound anyway. The downside of DVD releases for me is that I like to put Feldman on as I go to sleep and I am not equipped to play Feldman in my bedroom. Maybe when I get a Blu-Ray player for the living room I’ll put my old DVD player in the bedroom. Anyway this release is essential for all aficionados of Morton Feldman, John Tilbury, the Smith Quartet or just stunningly wonderful music. My highest recommendation. More great new music in this area coming out over the next couple of months. Most exciting of course are the next two volumes in the Morton Feldman Music for Piano and Strings from Matchless. The next one is particularly exciting for me as it contains Patterns In A Chromatic Field and Piano, Violin, Viola, Cello. I’ve mentioned earlier how much Feldman’s piano music means to me, but I also adore how he uses the cello and love it in the pieces where it stands out. So you’d think that Patterns, being cello and piano would be an all time favorite and I do like it a lot, but I’ve never been satisfied with any of the recordings I’ve heard. So I have a high hopes for this one (though I have to say I’d really like a Rohan de Saram/John Tilbury recording of the piece). Piano, Violin, Viola, Cello is, I think, my favorite Feldman chamber piece. The hatART version of the piece is one of the Ives Ensembles absolute best, but alas its out of print and I’ve only had a lossless rip of it (this is on Hat’s re-release schedule and I definitely will purchase it when it comes out). Anyway can’t wait to hear the take on this piece from this really excellent group of musicians. Volume 3 features a number of the short pieces but also another version of Trio. As reported earlier I have been quite taken by the recently released DVD of this piece on Mode so I will certainly enjoy hearing another take on it. Additionally there are two releases coming out on April 16th (probably coming sooner then the above) I recently found out about that have me interested. Discs of James Tenney and John Cage from Zeitkratzer Productions. The “Old School” series will also include releases by Alvin Lucier and Morton Feldman coming later in the year. I’m not very familiar with this ensemble and how their take on these pieces will be but there are certainly some very good performers in the group that I am famalair with: Frank Gratkowski, Hayden Chisholm,Franz Hautzinger ,Reinhold Friedl, Maurice de Martin, Burkhard Schlothauer, Anton Lukoszevieze, Uli Phillipp, Ralf Meinz, Matt Davis, Hilary Jeffery directed by Reinhold Friedl. A Spiral Cage is powered by	WordPress 4.6.14 and delivered to you in 0.305 seconds using 23 queries.